The Yamaha DXR 10 powered speaker pushes the boundaries of powered portable speakers. Boasting a Class-D power amplifier delivering 700 dynamic watts and 1100 peak watts in an enclosure that only weighs 32lbs! A 10" woofer featuring a 2" voice coil with ferrite magnet and a 1.4" compression driver, deliver a tuned frequency response of 56Hz-20kHz (+/-10dB). 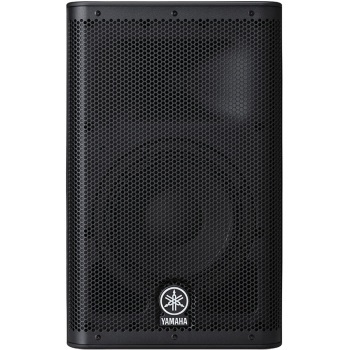 The Yamaha DXR 10 is a multipurpose speaker seen in setups as a main speaker, monitor speaker, or keyboard amplifier. Working with Nexo, a world leader in touring and professional audio, Yamaha's FIR-X tuning, developed for their DSR and DXR powered loudspeakers, is featured in all DXR series powered loudspeakers, bringing the acclaimed D-Contour processing presets: FOH/Main, Monitor, or off. Don't be fooled by it's size, the DXR 10 is a serious contender for users needing high output, lightweight, portable powered speakers!